For one- or two-semester courses in Construction Methods and Materials and Design in Architecture. 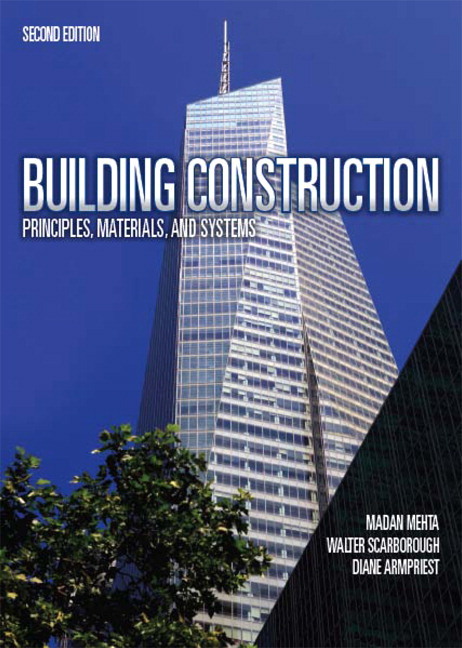 Exceptionally well-received and one of the most acclaimed university-level books on construction, Building Construction, Principles, Materials and Systems is a comprehensive and fully illustrated introduction to construction methods and materials. It’s informed by a core philosophy that sufficient grounding in the principles and science of construction is the best way to equip today’s designers and constructors to respond successfully to rapid changes in the built environment. By ensuring students are well-versed in the science and technology of materials and systems, the text aims to better prepare architects, engineers, and constructors to produce a resilient and sustainable built environment—a need that will grow with increasing urbanization across the globe. The science of building construction and design is evolving more quickly than ever before. The Third Edition of this outstanding text builds on the previous versions. It incorporates the latest updates available, features over one thousand new end-of-chapter problems, and now addresses common errors related to the topic. The organization of the text fosters a definitive understanding of general concepts before moving on to more complex concepts. Emphasizing a visual approach to learning, it includes original illustrations. Full color diagrams feature throughout the text. A unique organization creates an unparalleled exploration of building construction–principles of construction are covered in Part 1, and materials and systems of construction are covered in Part 2–providing students with a balanced learning approach. A focus on principles in Part 1 emphasizes the basic principles common to the performance of most building materials. By doing this in the classroom, the authors have experienced that they can preclude or reduce repetition when progressing from one material or system to another later on in the course. This focus also encourages critical thinking and informed decision making related to building materials and methods of construction. These principles will sustain over time even as materials and systems/assemblies are bound to change. The logical organization in Part 2 presents the materials and systems in an order based on the extent of their use in the working world. Cornerstone coverage of sustainability features a comprehensive chapter on sustainability and thorough integration of related content throughout the text. Extensive cross-referencing allows for quick and thorough referencing from Part 2 (Materials and Systems) to the underlying principles in Part 1 (Principles of Construction). This gives instructors and students maximum flexibility and the ability to start with Part 2 if they prefer. This may be particularly appealing for a one-semester course. Hundreds of original photographs and drawings have been developed specifically for this text–clearly illustrating difficult concepts and ideas. An extra-large trim size of 9” x 12” allows for an open and inviting layout so students can learn easily and effortlessly. Numerous examples with solutions prepare students for exams and real-world applications. Principles in Practice sections demonstrate practical applications of key concepts and reinforce the fundamentals that will sustain over time. A chapter on “Sustainable Construction” and the Focus on Sustainability boxes highlighted throughout the text address contemporary green issues that face the construction industry today. Practice Quizzes are integrated within each chapter allowing readers to test their comprehension before moving on to additional concepts. Expand Your Knowledge boxes offer readers the opportunity to learn more about a relevant topic being discussed in the main body of the text. Margin Notes include additional information and help clarify selected topics. End-of-chapter content, such as key terms, review questions, selected websites and suggestions for further reading, make studying for exams or doing additional research a breeze. A uniquely qualified author team builds on the professional experience of an architect, engineer, construction site manager, and academic. A team of expert technical reviewers participated in an unparalleled review process–one where field experts reviewed raw manuscript for technical and conceptual accuracy. A team of experienced educators contributed exhaustive insights during the development process –insights and suggestions that were later incorporated into the book. 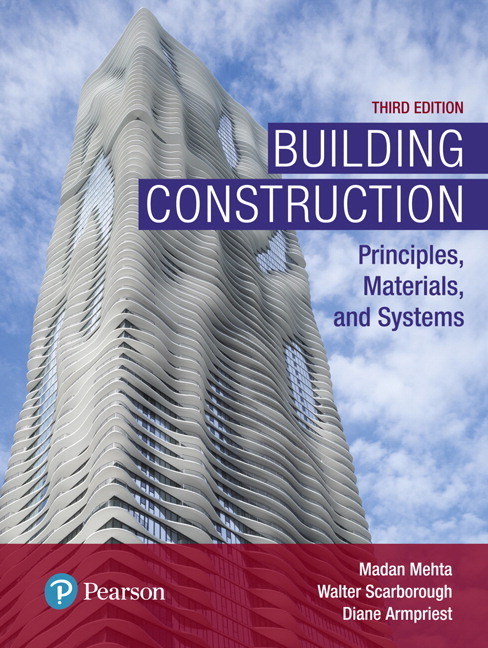 Building Construction: Principles, Materials, and Systems, 3/e, in full-color, has been substantially revised from its highly acclaimed Second Edition. Madan Mehta, B.Arch., M.Bdg.Sc., Ph.D., P.E., is a faculty member at the School of Architecture, University of Texas at Arlington, and teaches courses in construction and structures. He was previously the Director of the Architectural Engineering Program at King Fahd University, Saudi Arabia. A licensed professional engineer (Texas), Fellow of the Institute of Architects (India), and Member of the American Society of Civil Engineers, he has worked in India, Australia, the United Kingdom, Saudi Arabia, and the United States. With academic credentials in both architecture and engineering, he ran a comprehensive architecture/engineering practice while working as a faculty member at the Delhi School of Architecture, and he worked for a large general contractor in the United States during a leave of absence. He is the author of several full-length books and monographs on building construction, architectural structures, and architectural engineering. Walter R. Scarborough, FCSI, SCIP, is Vice President and Regional Manager for Hall Building Information Group, LLC. He is a specifications consultant and registered architect (Texas) with over 35 years of comprehensive technical architectural experience in specifications, document production, and construction contract administration. Previously the Director of Specifications for 10 years for one of the largest architectural firms in the world, he was responsible for building sciences research, manager of a department of speciers, and master specification development and maintenance, in addition to being the specier for major healthcare, sports, detention, municipal, and commercial projects, some valued in the hundreds of millions of dollars. He is active in the Construction Specification Institute (CSI) at the local level (past president, secretary, and technical director) and national level (Education Committee and Practice Guide Task team), holds several CSI certifications, was awarded CSI’s prestigious J. Norman Hunter Memorial Award for advancing building sciences and specifications, and is the revision author for the first and second editions of CSI’s Project Delivery Practice Guide. Diane Armpriest, M.L.A., M. Arch., is Associate Professor of Architecture, College of Art and Architecture, University of Idaho. Before joining the faculty in 2001, she worked as an architectural project manager, and as a project developer and construction manager for neighborhood nonprofit housing providers. Her teaching and research interests include the pedagogy of architectural building construction technology, the expression of structure and materials in Northwest regional architecture, and the relationship between building and site. Previously, she was Associate Professor of Landscape Architecture at the University of Cincinnati. Highlights of her work there include research in resource-efficient design and construction and working with students on design-build projects.